New Fillers for Long Lasing Improvement of Facial Lines & Depressions With time your youthful fullness in the face is lost and you start to look tired and droopy. Although facelift is still an option to restore your youthful appearance, many cosmetic surgeons are using advancements in medical technology to achieve similar or even better and more natural results without the risks of this major surgery. One of the most important advances is the development of Sculptra, a filling material that fills the skin safely and that is long lasting. Q. What is Sculptra ? Sculptra is a synthetic injectable material known as "poly-L-lactic acid." Poly-L-lactic acid is biocompatible (a material that does not harm the body) and biodegradable (able to be broken down by the body). Poly-L-lactic acid has been widely used for many years in dissolvable stitches, soft tissue implants, and other types of implants. Q. How does SculptraT work ? Sculptra is injected below the surface of the skin in the area of fat loss. Sculptra provides a gradual increase in skin thickness. Visible results appear within the first few treatment sessions. SculptraT will not correct the underlying cause of the facial fat loss, but will help improve the appearance by increasing skin thickness in the treated area. Sculptra can be used to fill depressions and augment desired body areas on any skin part. Most commonly Sculprtra is used to reverse signs of facial aging, such as wrinkles, folds, laugh lines, and sunken cheeks. The tired hollow facial appearance is a result of facial lipoatrophy. 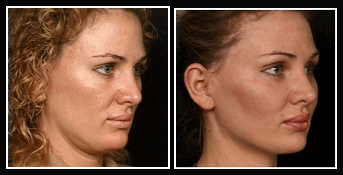 Facial lipoatrophy is the loss of fat in the face, characterized by loss in fullness, shape and contour of the face. The fat in the face is lost as a result of natural aging, smoking and certain medical conditions. Facial lipoatrophy may also be seen as a side effect from anti-retroviral medications used to treat HIV. The undesirable aesthetic appearance of facial lipoatrophy may be so devastating to ones self-image, confidence and social life that patients may even jeopardize their health by discontinuing their anti-retroviral treatment in hopes of improving their appearance. Sculptra may help improve these patients' lives as it is the first injectable treatment to receive FDA approval for this kind of lipoatrophy. Sculptra is injected below the skin surface in the area of fat loss. Sculptra does not correct the cause of lipoatrophy, but rather increases skin thickness and restores fullness to the face. After the swelling caused by the injection goes down and the water used in Sculptra is absorbed by the body, your face will appear as it did before treatment. Sculptra will then gradually increase the skin thickness by stimulating new collagen to form around it. Visible results appear gradually over 4 to 6 weeks. In patients with severe lipoatrophy, 2 to 3 treatments may be needed to acheive the desired aesthetic results. After injections, most patients feel comfortable returning immediately to work and their daily routines. You may experience slight pain, redness, or bruising. Cold packs should be applied for 10 minutes every 1-2 hours until bedtime that evening. You must massage the area for 5 minutes, twice daily, for 7 days after your treatment. Sculptra is well-tolerated, with adverse effects generally limited to reactions at the site of the injection. The most common side effects with Sculptra are related to the injections themselves: bruising, swelling, tenderness, redness. These typically resolve in several days. One possible delayed side effect with Sculptra can be small knots under the skin in the treated area, which may occur 6-12 months after treatment. These small bumps are usually only felt, not seen. Rarely, visible bumps or color change in the treated area have been reported. Although rare, some people may be allergic to the PLLA. If you are allergic to Vicryl sutures, you should not have Sculptra injections. Sculptra lasts longer than other FDA-approved products for facial skin enhancement. Studies have shown results from Sculptra lasts from 18 months to over 2 years. For those who are not candidates for or do not desire Sculptra, other treatment options to improve and correct lipoatrophy include: fat transfer, feather lift, other filling materials such as hylaform and restylane and surgical face lift and implants.